Laurette was born in Brontëland, West Yorkshire, but fell in love with France aged 13 when her host family sent her to the village boulangerie to buy the morning baguette in her pyjamas and dressing gown. Graduating with a degree in English Literature from the University of Leicester, she began a teaching career in the UK and the US before moving to Toulouse, SW France, where she worked with adults whose motivations for studying the language of Shakespeare ranged from passing advanced exams to launching rockets. She met a lot of people, learnt many new things (though not how to launch a rocket), had a great time, wrote a best-selling textbook, and fell ever more deeply in love with la belle France. In 2011, moving from the bright lights of Toulouse to a small hamlet in Cathar country, she began her dream of writing a romantic family saga set in her adoptive country. The four books are published as the French Summer Novels Series: Biarritz Passion, Hot Basque, The Passage of Desire and Biarritz-Villa Julia. 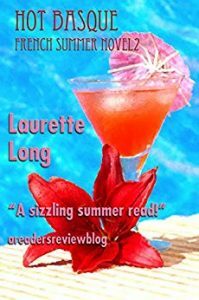 When she’s not writing, Laurette usually has her nose in either a book or a lavender bush. She’s proud to have created a Mediterranean garden from a hill of brambles, now home to hundreds of bees, butterflies and the neighbour’s cat, in which she and her partner can listen to the nightingale and watch the sun go down.